Description An oversize 161 ballpoint in palladium trim. A very impressive and handsome ballpoint in perfect working order. Description Montblanc Writers Edition Mark Twain set of fountain pen, ballpoint and pencil. Fountain pen is fitted with Montblanc 18 carat gold rhodium plated fine nib. All three instruments are in perfect order and the set has been rarely used. Limited Edition set no 776 of 3000. With original box, outer and all papers. Description Montblanc 252 manufactured 1950's in superb overall condition. Fitted with a Montblanc 14 carat gold fine nib. Pen refurbished and new piston fitted. 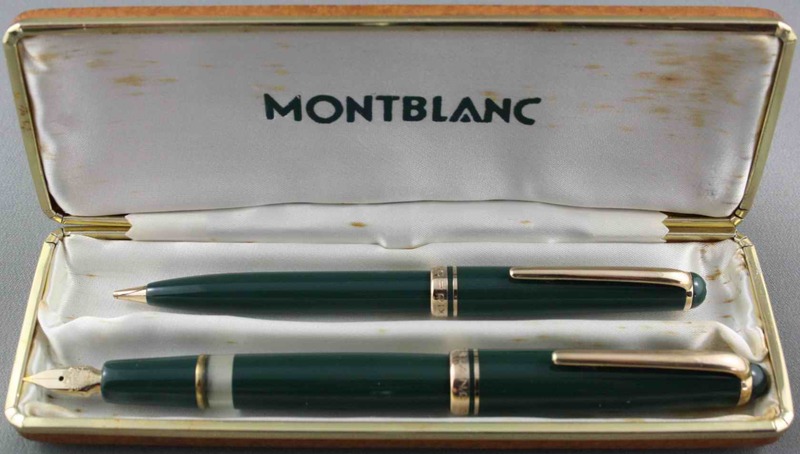 Description Montblanc 320 marked "Steno" (presumably stenographers') manufactured early 1960's. Extra fine 9 carat gold nib. Pen refurbished and new piston fitted. Description Circa 1976. Fine Montblanc 14 carat gold nib. Cartridge filler only. Not supplied with converter. Very slight brassing to cap clip and occasional pin-point dot to barrel and cap finish. Description Circa 1967 and fitted with a Montblanc fine 14 carat gold nib. The only vice this pen suffers is slight brassing to one side of the cap clip ring. Description An almost perfect 146 fitted with 14 carat gold medium nib. Only the occasional very light surface scratch. Description Both are fine examples of hard to find Montblanc models. Both made mid 1950's. The Fountain Pen carries a 14 carat gold original, Fine Montblanc nib which is unblemished. Original clear markings on the blind cap. Pencil is fully operative. Both are in superb condition, have seen little use and in the original box which is showing understandable signs of age. Description This Traveller model was produced circa 1995. In Bordeaux with Vermeil cap. Original 18 carat gold Medium two-tone nib. The pen has been inked but seldom used. Comes with original box, outer and guarantee papers but without original Traveller leather pouch which was often included with this model. Description Bordeaux model 147 Traveller with original Montblanc 18 carat gold broad, two-tone nib. Late 1990's production. Has been inked but little used. Original box and papers. Description A near new Model 161 in Bordeaux. With box and papers. Description A limited edition Dumas in pristine condition manufactured 1996. Some wear of chalk in signature mark. Limited edition no. 8938/9008. Non-original box. No papers. Description Near mint set which has seen little use. Manufactured 1990. Fountain pen carries 14 carat gold unmarked Medium nib. A nice set for the discerning. With original box.